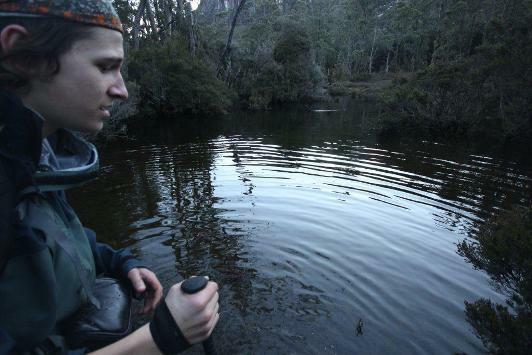 In this article we welcome Greg, who has been kind enough to share his recent Tasmanian bushwalking experience on a trip from the Walls of Jerusalem via the Never Never to the Overland Track in Tasmania. The first day was spent walking to Dixons Kingdom Hut and we had an evening of wind, heavy rain and then a decent blanket of snow. Surprisingly there was already another couple in the hut. My son joined them for the night and me being conscious of the fact I snore like a Yeti with a stubbed toe meant I slept outside in a bivy bag. I don’t mind the bivy and have used it a few times. The next morning was a combination of low cloud and falling snow. We waited for it to lift so we spend the day climbing some peaks. Unfortunately it looked set for the day so I gave the mountain climbing a miss. We had a casual walk in the afternoon down to Lake Ball Hut. No problems getting down there all any tracks or pads were covered in snow. 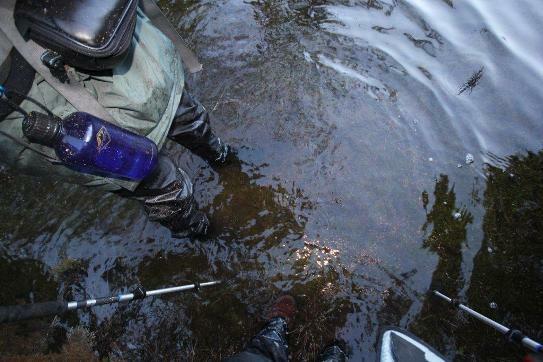 Hope their boots were waterproof! The next day was to walk from Lake Ball Hut to Lake Meston Hut at least and possibly to Junction Lake Hut if we were going well. It was slow walking though due to ice on rocks and the path. Being insanely clumsy doesn’t help but even my son with good knees was falling now and again. Lake Meston Hut was reached and any thought of trying to go further were scotched by the early evening of winter. I was annoyed to lose a great pair of gloves though. I fell for the, ‘just hang them on the side of the pack trick, they will be fine’. Well, they weren’t! When I realised I’d lost them I didn’t contemplate back tracking. If someone finds them can they look after them? They’re good! Lake Meston Hut is great though and we really found ourselves getting comfortable! This was the problem as we got up for the next day way too late! We found the walking quite comfortable early but lost time trying to find Junction Lake Hut. The GPS reading of where we were walking would be quite embarrassing as it appeared we were doing circles. Paths and pads seemed to go nowhere and it was a mistake to rely on them. In the end we found the hut for a quick snack. By now it was afternoon and I checked the intentions book within the hut. I was a little disturbed to read that someone only a few days earlier had tried to walk across the Never Never but had to turn back as the Mersey River was too swollen and too hard to cross. I was hoping he didn’t know where the magic log across the river was. I was relying on your GPS reading for that! We found the Parks intention box okay and filled it in noting that the book looked pretty new and there was only one other entry in it. It did look like a rarely walked area in winter! The same thing applied which you would have experienced. It was hard to find the easiest spot to walk in. We were never lost and knew exactly where we were but we didn’t know the best way to go. Too near the river was a mistake at one point. I belted my way through some tea tree and ended up leading us into a lot of water! The river was swollen and at one point it was way over the spot it should have been! 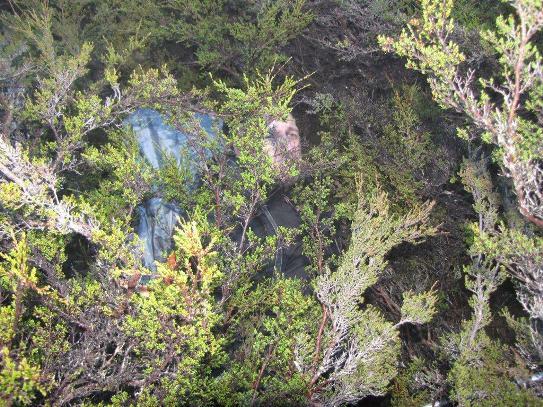 Hemmed in by bush we elected just to get wet and ended up walking in water that reached knee deep. This was part of the ‘track’ you had walked so assumed it hard broken it’s banks a bit and this led me to be worried about the crossing. On we went with boots full of water and found the trees insanely difficult to casually walk through. A few times I was on my knees as it was the easiest way with a pack on. I have never fallen over so much in one day. Ever! At my last count it was 10 times. My son was happy to correct me and say it was 13 times! At one point we were both on the ground lying in trees wondering exactly who’s idea it was to walk here in winter! If it wasn’t trees snagging us it was the soft ground where a foot would vanish in perfectly solid looking ground up to the knee! We were laughing initially but as the day was getting longer and we seemed to be going painfully slow the worry of early darkness became an issue! In the end we found the log across the river as per your reading! It was still there and a relief as the water was flowing pretty quick. I didn’t fancy getting even wetter. 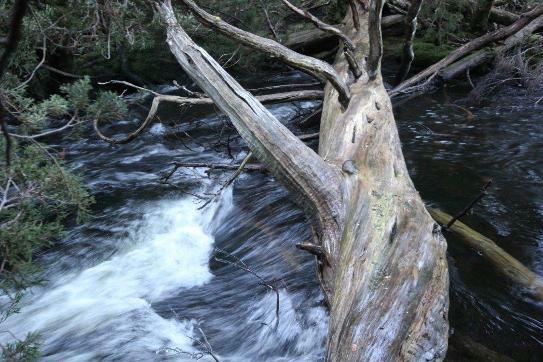 The log was mega slippery though and due to my clumsiness I did not even consider walking across with a pack on. I went for the straddle approach that was made trickier by branches still on the log. After some wild looking gymnast moves I managed to get across with my son following. We were thinking the rest should be a stroll now to the Hartnett Falls track. Umm…wrong! I found the track/pad vanished and light was fading fast. It was hard to pick anything out once the light really dimmed. On went the headlamps but they’re no substitute for natural light when looking for a track. Again we were belting our way through tea tree. Going in the right direction but just finding no opening whatsoever to get moving properly. I have no idea where the ruins of McCoy’s Hut is?! We didn’t see that! I was lucky that I also had the GPS reading from my walk on the Overland last year. It had the track to Hartnett Falls on it and not knowing anywhere where a track was in the dark we elected to go straight for it. Pitch black for the previous hour and we stumbled on up to the Overland Track. I’ve never been so happy to see the signs on the Overland! We walked on slowly until we reached DuCaine Hut. At this time it was 8.00 pm and any idea of making it to Kia Ora Hut were gone. We were both spent and elected to stay at DuCaine. We were both a little strange mentally and started to babble about what a wacky day it was! I don’t think I’ve had a harder days walk over such a short distance as that one. There aren’t many photos taken that day but I’ve included a few. The couple where we are standing in water show the flooded section we had to walk through. There is a photo of the trusty log! The last one is a bit deceptive. No, I’m not walking through a tree. I’m actually lying on my back after falling over and wondering how I’m going to get up with the pack on! I won’t go into detail with the rest of the trip unless you want the info. 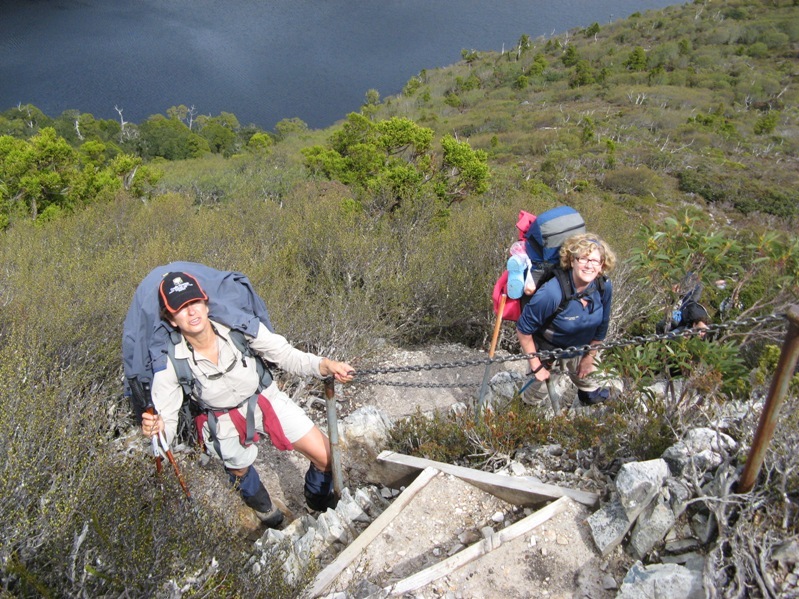 It was a straight forward walk north to Cradle Mountain. Quite relaxing after the Never Never! So, there you go. Wet feet, bushbashing in the dark, unable to find the track and falling over a lot! Does it get any better (or worse) than that? Have you had an adventure under similar conditions? Thanks very much to Greg and his son for sharing this trip report. If you want to read about more of Greg’s adventures, head over to his site Hiking Fiasco, it’s a lot of fun. Great read, I can totally recall the bushes and trees now. We were a bit luckier with our Never Never crossing even though we crossed the Mersey to early. Took us some 4-5 hours from Junction Lake to Hartnett Falls… But at least there was no flooding and we managed to get to Windy Ridge Hut before nightfall. Photos and story are on my blog. Thanks for dropping by , really appreciated. I just had a quick peek at your site and write up about the trip. It is fantastic! Thanks for sharing. 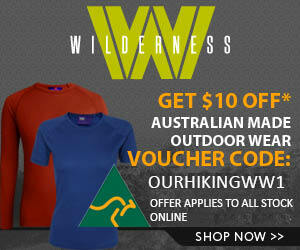 I will wack a link up on our Facebook page too: http://www.facebook.com/OurHikingBlog or jump across and share it yourselves! To anyone reading this, here is the link to the article: http://www.puersch.net/?p=860 – recommended reading.